Hoye Tractor Parts is a family owned and operated business based in Iowa Park, Texas. We started very small... actually selling Yanmar parts out of the owner's garage in 1999. Orders were packed at night after a long day working on the farm and taken to the post office to be mailed out the next day during lunch time. Many of the first phone orders were taken on a cellular phone (those big bag phones from the late 90's) by the owner while he was running a combine during wheat harvest (you may have noticed the background noise if you called then). Within a couple years things had grown enough that he brought on his mother as a partner and to keep track of the bills and then hired his brother-in-law to help with tech support and shipping. Since then we have added 5 more people to our extended family. For over a decade we have been blessed with amazing customers and have since grown to fill up our 18,000 square foot warehouse. Our north Texas location means that most UPS packages will arrive anywhere in the US in around 1 to 3 business days. Of course, we also offer 2nd Day & Next Day air guaranteed delivery services too. Why are you not open on Saturdays? Most of us here came from a farming background where working 6 or 7 days a week was not uncommon. We rarely ever got to spend time relaxing with our families. We decided early on that this parts business would not be open on Saturdays & Sundays and we would spend it with our families. Do we allow walk in customers? Why Don't You Have A Sign Out In Front Of Your Building? See the question above. We are just not set up for a lot of walk in customers. If we put a 'tractor parts' sign up then we would be flooded with customers looking for all sorts of random Massey, Kioti, New Holland, Deere, and Kubota tractor parts. We only sell Yanmar parts and there are very few Yanmar tractors in our area. Those customers that are in our area know where were are. Do you actually stock parts there or do you just drop ship like a lot of the other tractor companies? At last count we had around 150,000 new yanmar tractor parts on the shelf and somewhere around 100 used Yanmar tractors parted out. We like to be in complete control of your order so, 99% of the orders we take get shipped from here the same day. If a part is not in stock, however, we may be able to drop ship it from another warehouse. What about small parts like gaskets or O-rings? Unlike almost all of the other "Yanmar Parts Dealers" that sell a couple of aftermarket clutches and a few common pistons, we are a FULL line parts dealer. We stock all of the same aftermarket clutches & pistons (only a lot more of them) but also stock thousands of genuine Yanmar parts imported straight from Japan and almost all of the small parts you will need to keep your tractor in top shape. 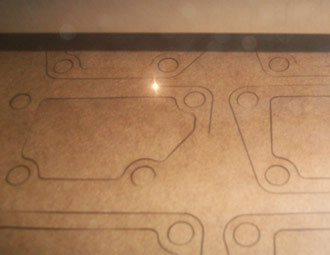 In fact, we recently invested in a CNC laser cutter just to reproduce obsolete gaskets. There are now hundreds of gaskets that you can only get from us. We also have a CNC plasma cutter which allows us to reproduce obsolete brackets and other flat parts. Of course there will still be a few odd parts that we will have to order or can not get but that list is MUCH smaller than the other "dealers". Are Yanmar Tractors Hard To Get Parts For? There is a lot of misinformation about owning a Yanmar and parts availability is a big one. There are Yanmar tractor models that you need to avoid but in general parts are MUCH easier to get for a YM series Yanmar than the same year John Deere! In fact, we can now almost build some models from scratch just from the parts that we keep in stock!